Most of the time, your dentist performs dental extractions when wisdom teeth are putting a patient’s oral health at risk. They can cause misalignment or become impacted, increasing the risk of an infection. However, other cases require extractions if a tooth is severely damaged either from decay or from an injury. The type of extraction you need will depend on your unique case and what your dentist determines is the best decision for your oral health. Here are the most common types your dentist uses and how they differ! Simple dental extractions are given this name because the process is the easiest and the least invasive to perform. When a tooth is visible in the mouth, most general dentists can remove it without any issue. In the first step, your dentist numbs the tissue around the tooth so patients don’t feel discomfort during removal. To remove the tooth, dentists use a dental tool known as elevators, which slowly moves it out of the gums and loosens it. Once the tooth has elevated enough, your dentist uses a pair of dental forceps to grab and remove it. Rocking the tooth back and forth is essential to breaking the periodontal ligament, a fibrous tissue that keeps teeth inside the alveolar bone. Thankfully, elevating the tooth makes it much easier to remove. In the event that a tooth is not visible, such as when a wisdom teeth erupts but fails to break through the gum tissue, a surgical dental extraction is needed. It’s also necessary if the tooth broke while still underneath the gum line and individual pieces need to be removed. Here, an incision is made into the tissue surrounding the tooth, making it easier to extract. These tissues can be elevated to make the tooth visible, however this can vary if jawbone requires some removal for extraction to continue. 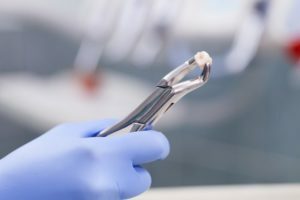 Since the nature of surgical extractions is more invasive, you may need to see an oral surgeon for them to be removed. Your dentist can perform either extraction, depending on your unique case. She prefers to perform simple extractions when she can because they require less post-operative care and are less associated with the possibility of adverse effects than surgical extractions. However, if a tooth is causing problems and cannot be easily accessed, your dentist won’t have any other choice. Regardless of the extraction your dentist chooses, you can rest assured that you’re in good hands. The next time you need a dental extraction, you won’t want to put it off. Instead of letting the problem get worse, schedule an appointment with your dentist! Dr. Trinh Vo earned her Doctor of Dental Medicine degree from the Boston University School of Dental Medicine. She is a restorative dental expert and performs most dental extractions in-house herself. To learn more about her practice, contact her through her website.